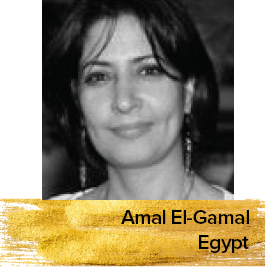 Dr. Amal El-Gamal is an Egyptian writer and film critic with nine books about film criticism to her credit. In 2009, Dr. Amal won the Abdel Hai Adib Award. She has been a jury member of many prestigious film festivals in Italy, Malmö, Qatar, Egypt, Kuwait and Sudan. She has been selected many times to participate with her film studies in workshops at the University Of Bonn, Germany.